With just a few plants and florist supplies, you can make a table garland that’s fresh, simple and the perfect natural accent to your table. Take a few branches of your favourite greenery from the garden like seeded eucalyptus or anything you can find in the garden really, we also love blue gum eucalyptus or silver dollar. 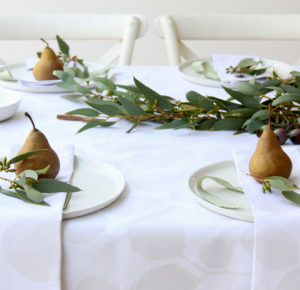 Gum nuts, rustic pears and cinnamon are great for texture too. If you don’t have a garden with eucalyptus trees then most florists or even good local fruit shops sell greenery and foliage these days. My favourite ‘go to’ is Jimmy’s on Avenue Road in Mosman. He has been supplying me with everything for photoshoots for years, and always throws in a few free pieces of fruit for me too, thanks Jimmy. To make a very basic and ‘one off’ garland for the table all you need is leaves and gardening shears, but if you want your garland to be portable and not fall apart when you move it, or if you want your garland to last a week or so then I would suggest investing in the small floral water tubes to kept the leaves hydrated and florist wire to hold it all in place. You can purchase these from any craft store such as Spotlight or ask your local florist to get you some from the flower markets. 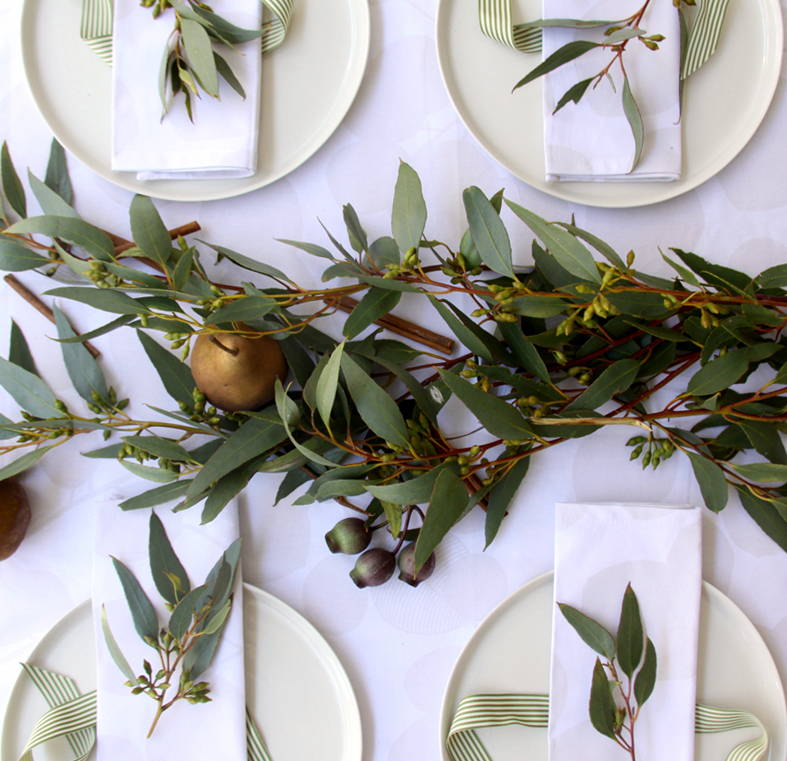 It takes about three to four bunches of seeded eucalyptus to make a 1.5m long garland. Start with one large branch of seeded eucalyptus, then add a few smaller branches to it, ensuring you keep the garland relatively narrow so can have enough space on the table for your place settings and glasses. 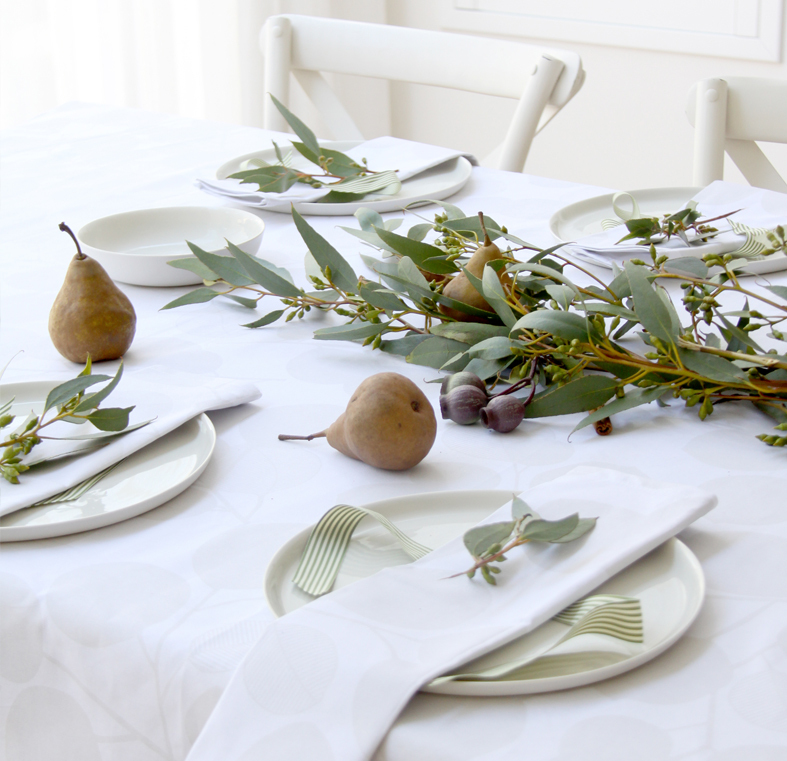 Continue to add more eucalyptus leaves in the same direction as the first branch (so all the ends are pointing in the same direction down the centre of the table) You can start to secure the larger branches with a twist of floral wire. 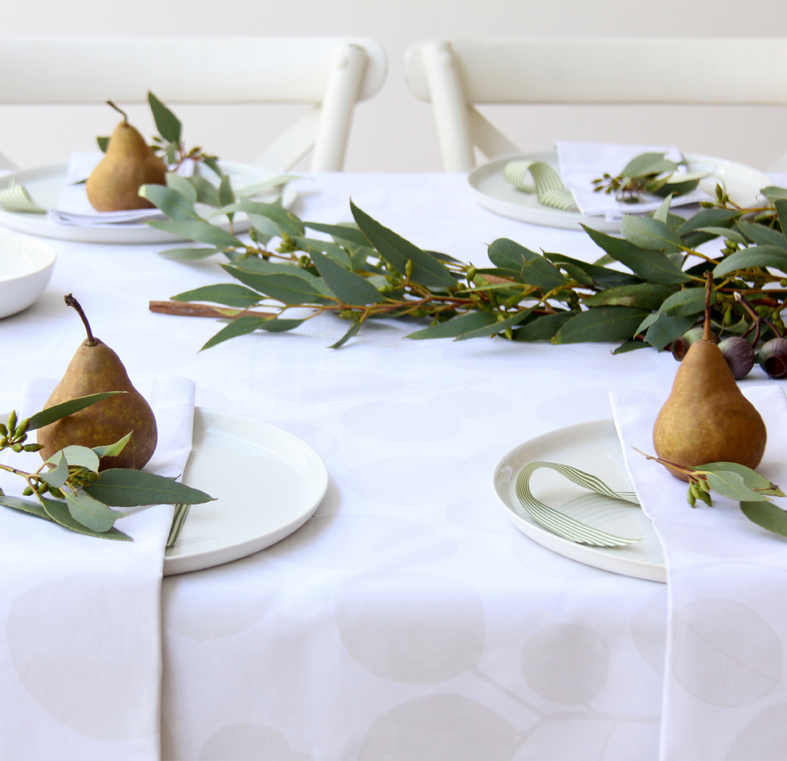 Add the more delicate eucalyptus leaves or gum nuts over the top of the larger branches. When you reach halfway down your table, time to stop because you have finished the first section of your garland. For example, if you want it to be 1.5m long, stop when this first piece reaches about 75cm long (or the middle of your table). Now repeat the above steps and make a second garland. Once you have finished the second you can then join your two garlands together. Ensuring that the leaf tips are facing outwards (these will be at the ends of the table) place both garlands down the centre of the table. With the ends of the cut branches meeting in the middle secure these thicker branches with wire. Then take smaller leaves to cover the wire. Having the garland join in the middle like this will ensure that each end of your garland features the lovely delicate leaf tips and hides all the thicker branches in the middle. If you used floral tubes, time to fill them and place on the base of each branch, hiding them as you go with a few extra leaves.